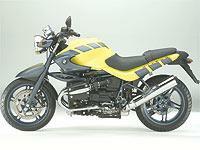 BMW won critical acclaim when it unveiled the R1150R – for making a bike that truly tempts the eye. But, as Prince Charles once said, " rather like a carbuncle on the face of a much-loved friend " , they’ve seen fit to give it a paintscheme that ain’t exactly a beauty treatment. As well as retina-damaging colours called " Dakar Yellow " and " Ferro Metallic " , most of the chassis and wheels have been blacked out. Someone with taste has decided there’s no way they could get away with charging more for this particular paintjob in Britain. Our European cousins are being asked to fork out an extra £220 for the option. It will be available in January and will cost £6800, the same as the existing metallic red, metallic blue or black in the UK. Is council Cat &amp; Fiddling speed limits?